Sisters of Omega Phi Beta pose with members of the Lambda Alpha Upsilon Fraternity, which won the stroll competition. Students at SUNY Binghamton are dancing for charity. 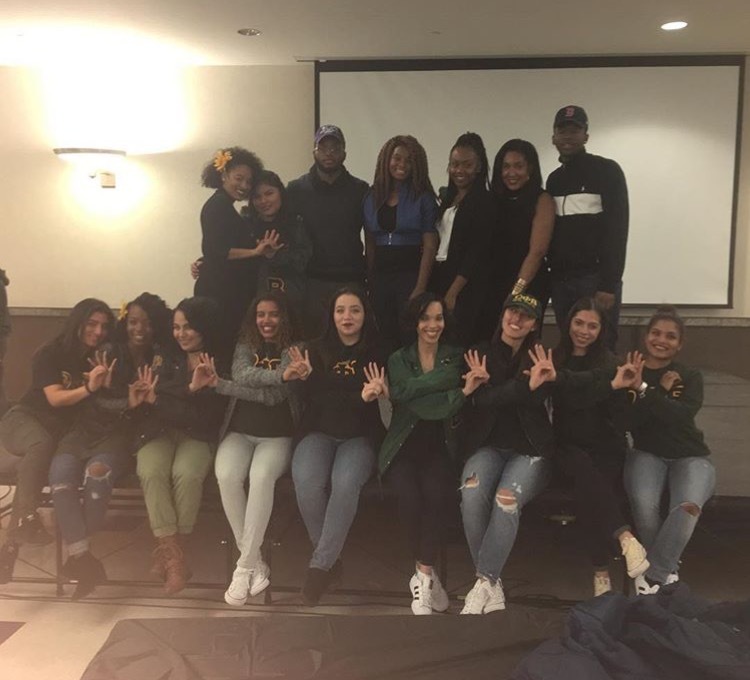 Last month, the university's Omega Phi Beta Sorority collaborated with the Haitian Student Association to hold the ninth annual “Strolling for a Cause" fundraising event. Proceeds went to the Pan American Development Foundation's relief efforts in Haiti after Hurricane Matthew. "We feel strongly about giving back to our community in the Binghamton area but also outside of our community," says Maritza Minchala, president of the Delta Chapter of Omega Phi Beta Sorority. "We really appreciate the work PADF participates in. This motivated us to go above and beyond to make this event a success." As part of the event, fraternities and sororities perform a “stroll," a dance that shows unity among Greek organizations, Maritza explains. The group raised nearly $900 for Haiti. Proceeds mainly came from the $3 entrance fee at the event. PADF is providing humanitarian aid to communities in Southwest Haiti affected by hurricane Matthew. To date, the Foundation has delivered hygiene kits, emergency food kits, bottled water and water purification tablets to more than 23,000 people. "We really hope that our donation will help out in any way possible," Maritza says. PADF is grateful for the commitment, passion and support of our donors. Do you have a fundraising story? E-mail us at connect@padf.org. Sisters of Omega Phi Beta Sorority with members of the Haitian Student Association, Binghamton University - SUNY. Maritza Minchala, president of Omega Phi Beta Sorority (left) and Chelsea Lindor, president of the Haitian Student Association. kick off the show.